When we think about the ways that our debt affects our lives, we often turn to the physical things. We think of the things we can’t buy, the experiences we can’t partake in, the opportunities our children may miss out on, or the things that we cherish that we could lose. However above all else, our debt affects our health in a massive way. And while we are not health care practitioners at BNA Debt Solutions, we see clients coming into our office every day dealing with massive amounts of stress, debt-related depression, and all the side effects that come along with them. Our Licensed Insolvency Trustees can help you find not only debt relief and but hopefully relief for the health related consequences. Here are some big reasons why getting your financial health on track will help you become mentally and physically healthy. Debt is stressful. It weighs on the mind, drags us into feelings of self doubt, and without question, it impacts our personal relationships. There are countless studies outlining the negative ways that stress affects our lives, but there are clear links between stress and substance abuse, obesity, suicidal thoughts, anxiety and overall diminished sense of self-health. Debt is also a major factor in the breakdown of marriages and relationships, with a 2012 study shows that couples who argued over debt and financial issues at least once a week were much more likely to divorce. Let’s be honest, you probably wouldn’t even be reading this if you haven’t experienced some kind of financial related stress that has affected your life in a negative way. When we can reduce stress, we can live longer, happier and with fewer complications later on in life. A 2010 study from the Royal College of Psychiatrists shows that one in four people suffering from mental illness are also reported to have significant debt, which is significantly higher than people who do not have mental health issues. Compounding this problem is the overwhelming feelings of isolation that many debtors face when tackling their finances; the feeling of not being able to spend time with friends, take in social activities or do the things that used to bring joy because they can no longer afford. Climbing out of a pit of depression brought on by financial issues can seem like a daunting task, however, as with so many of our clients, once we show them how something like a Consumer Proposal can bring immediate relief, the dark clouds begin to lift. It’s clear there’s a correlation between debt, stress and depression. But what is all of that stress doing to your body? For starters, it’s negatively affecting your immune system. Stress creates chronic inflammation that harms the body’s internal tissues and it also suppresses the immune cells needed to fight off infection. Have you ever found yourself getting sick after a very stressful event? It’s not a coincidence. When your body goes into “fight or flight” mode, it produces more cortisol, which prepares your body to run away from the fight it thinks is coming. That same cortisol weakens your immune system by lowering the proteins needed for maintaining immunity cells. We’ve seen it time and time again: debt piles up, stress and depression begin to take hold and it affects you not just mentally, but physically. And just like many other physical ailments, if they are left to fester, they only get worse. The stress starts with a mountain of debt, and once that stress hits your immune system, it moves onto your internal organs. 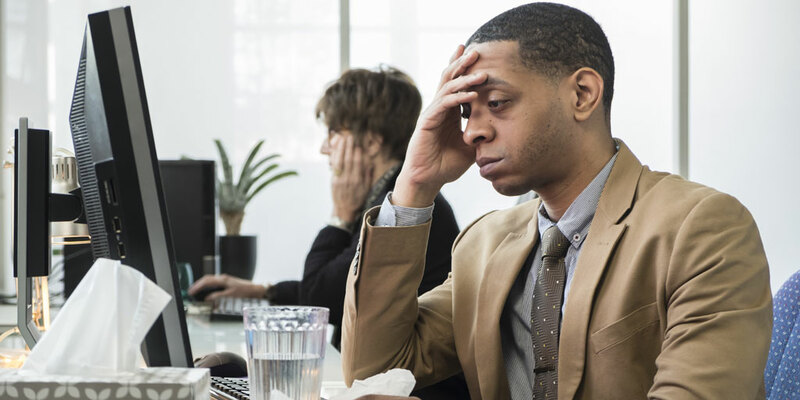 According to a 2008 study, subjects who reported high levels of financial stress were 27% more likely to have stomach ulcers, 44% more likely to suffer from migraines, and were twice as likely to have suffered a heart attack. Don’t let debt and credit kill you! It’s not a life sentence unless you let it become one, and at BNA Debt Solutions, we can help turn the tide. Debt will also make you less likely to do something about your health. A 2013 study shows a clear link between high credit card debt and fewer doctor and hospital visits. Respondents were more likely to skip going to a professional as help is seen as too costly. And while in Canada we aren’t impacted with fees at hospitals and doctors on the same level as our neighbors to the south, Canadians still have to pay for professional services from the optometrist, dentist and mental health professionals. All of these factors paint a very serious picture, but help is out there. At BNA Debt Solutions, we are committed to helping Albertans find debt relief. When you file for a consumer proposal or personal bankruptcy, you gain instant relief from creditor calls, and we can help you clear up your debt once and for all. Making the first move to improving your financial, mental and physical health is as simple as a phone call or an email. Reach out or call us at (587) 316-9090 to book a consultation today.